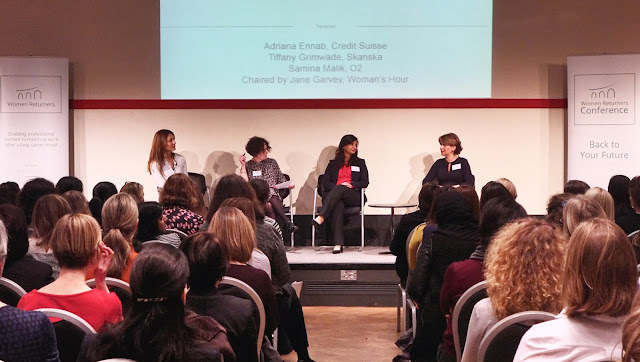 If someone had told me 6 months ago that I would be a panelist at the first Women Returners Conference being interviewed by Jane Garvey (of Radio 4 Women’s Hour fame) with two other incredibly talented and inspiring panelists, in front of an audience of nearly 200 women, talking about my successful journey back to work at O2 … I would probably think they were mad! My experience in looking for suitable roles to get back into work had been that I had a CV gap and I couldn’t return to corporate world. My degree, my previous extensive corporate experience for 11 years, my voluntary work … it all counted for nothing. The fact that during my “time out” to raise my family I had continued to develop whilst doing one of the most difficult jobs around ... as a leader, innovator, problem-solver, negotiator, teacher, project manager, care-giver, nurse, psychologist, financial manager, supreme organiser … basically as a mother … didn’t count. I was told the best I could do now was to become a part time teacher/tutor or executive assistant. But I wasn’t going to let that stop me as I knew that there was more to me. The constant googling paid off … I read about Women Returners a leading organisation in the returnship space, offering help to people like me. In one of their newsletters I saw the O2 Career Returners programme being advertised. This was it, I thought. My skillset was relevant, the commute was manageable, a work/life balance was on offer … I was going to go for it. Fast forward the last 6 months or so and on Monday I attended the sold-out Women Returners Conference as a panelist, to talk about my “successful return to work” journey in a room full of hugely talented and qualified women … an untapped pool (more like a sea) of potential … looking to make their own journeys back to work. Thank you Julianne Miles and all the talented team at Women Returners, for your work in this area is amazing, actually life changing. I was honoured to be invited as a panelist and proud to represent O2, a company investing in Diversity & Inclusion programmes because it recognises that it makes business sense to have an employee workforce that reflects its 25 million customer base. It also makes business sense because having a diverse workforce creates happier, more productive and more innovative business teams. To all those who, for whatever reason, decided to leave work but are now looking to return … know that it is possible. Stay positive and keep an open mind about the opportunities that come your way. Believe in yourself and your own strengths, don’t let the inner critic grind you down. Engage with Women Returners (or similar organisations) to help support you on your journey. The journey will have twists and turns, it might be smooth or bumpy but it’s a journey of discovery and I look forward to what lies ahead on my road to success.